A vicious war has exploded at National Lands Commission with top executives going for each others’ throats and releasing damning information on their dirty deals to fix each other. 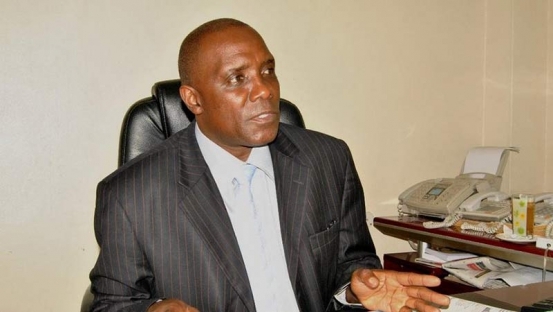 One camp rotates around chairman Mohammed Swazuri and deputy and another camp around chief executive officer Tom Chavangi that has also head of communication Khalid Salim. The Swazuri camp leaked an audit report linking Chavangi in dubious tender awards. The Swazuri camp was bitter after a local daily exposed the chairman and linked the expose to Chavangi. Already other state security agencies are focusing on a cartel of greedy public officers, unscrupulous lawyers and shadowy businessmen behind theft of billions of shillings meant for compensating owners of private land acquired by the government has been exposed. This group comprises officers from National Land Commission, Ethic and Anti Corruption Commission and the Treasury working in concert with corrupt lawyers and businessmen. They have stolen billions of shillings by lodging and processing fictitious claims for compensation using fake land ownership documents. The government has lost billions in the process, especially in the compensation for land acquired during the building of the much vaunted Standard Gauge Railway. The ring leader of this cartel is a top NLC official according to Swazuri ally we talked to. The said official is a shadowy character with questionable academic record. It is mysterious how he got such a big job despite having a criminal record. He was once charged in court for threatening to shoot a man in a night club over a woman. He is also currently trying to grab a 400 acre land in Isinya, Kajiado. There is a Luhya man who died and the widow does not know anything about the land. The said officer is in the process of falsifying land records to transfer the property to his cronies so that they can sell it. The officer is also under scrutiny after he was recently ordered to recover some Sh221 million from companies he fraudulently and illegally paid compensation for SGR despite NLC committee rejecting the compensation claims. In an internal memo in our possession, a NLC commissioner Abdikadir Adan is directing officer to recover all the money after Chavangi misused his authority and forced the director of finance to pay the money. This is after the officer took advantage of the absence of other NLC officers during Christmas holidays to fool Swazuri into approving the compensation of using fake title deeds. The money was paid to agents of this cartel. The officer is also under probe after internal audit revealed that he has been paying ghost suppliers for goods never supplied to the commission. Sucked into the scam is NLC director of communication Khalid Salim. Recently, a commissioner Emma Muthoni became a victim of this cartel because she is perceived to be strict as secretary and legal adviser to the acquisition committee at NLC. She is also being targeted for being close to Abdikadir who ordered the officer to recover the Sh221 million illegally paid. The said cartel organised for Muthoni be arrested by EACC officers. After failing to find her culpable, they are now purporting to conduct a lifestyle audit on her. EACC pretends to probe transactions at NLC just to hoodwink people. For example, there is ongoing process of compensating land owners for the Lamu coal project. EACC has already written to NLC yet no payment has been made. EACC is also purporting to investigate compensations for the proposed Likoni Road- Waiyaki Way expressway yet the process is still under survey. Another member of the cartel recently attempted to steal Sh4 billion from NLC by lodging fictitious claims using forged title deeds using names of his relatives. Despite NLC commissioners discovering this attempted fraud, no action has been taken against the lawyer due to his close connections to the EACC CEO Halakhe. The audit report unearths inflation of tenders, falsified tender minutes, dubious award of tenders and suspicious payments. Now the Swazuri faction wants the Directorate of Criminal Investigation headed by George Kinoti to investigate the corruption. They say those involved at NLC have roots at EACC and are well protected. A number of firms have been linked to the scam and those in tender award deal received kickbacks running into millions. Companies featuring in the scam are Acute Supires which was paid Sh1.7m in 20 tablets supply. No tablets were supplied. Persio Limited received Sh1.1m to deliver 16 digital voice recorders and 12 digital headphones. The said goods cannot be traced. The firms are linked to director communication. Value Digital Company was paid Sh6m to supply 20 toners, 30 hard disks, 30 modems, 408GB flashdisks and 60 16B flashdisk. It has also emerged, David Katalinga in Chavangi faction who is the procurement manager helped Median Data Communication to be paid Sh6.6 million for supply of 10 office paper shredder at Sh316,100 each. Kinoti has been asked to investigate the cost of one shredder which is Sh128,000 each and had Sh316,000 each quoted by Mediant Data. Through procurement via email courtesy of Kitalinga, Mediant Data was also given an order to supply five other paper shredders at Sh317,000. 15 water dispensers at Sh37,000. The total cost was Sh2.1million. Smartways Holdings was paid Sh4 million to supply two photocopies and two scanners. Formula one was dubiously awarded a tender to supply normal biropen at Sh150 each, staple packet at Sh1500 and normal writing pad at Sh2,500. Now with the parties involved in the scam having protection at EACC, apart from DCI, National Intelligence Service is also being asked to help in the investigations.